14 years ago, Steve Fugate took it upon himself to walk across America, as therapy after losing his son. 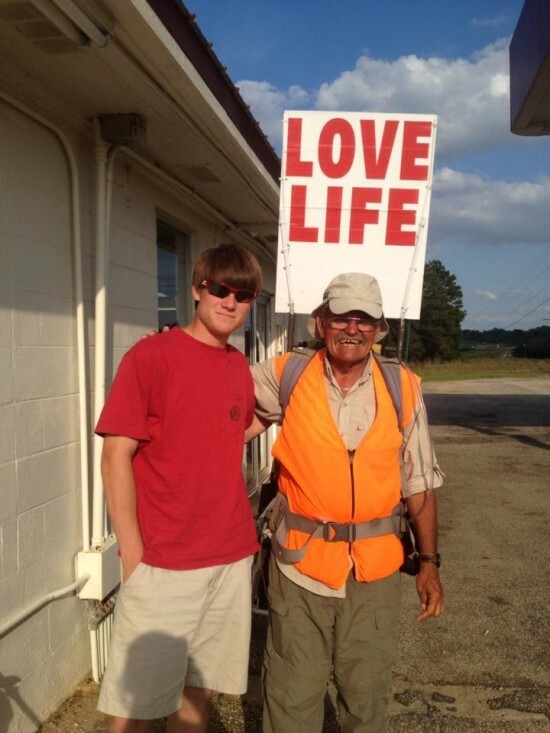 Through his extraordinary journey, he hoped to spread just one simple message – ‘Love Life’. It’s estimated 67-year-old Steve has walked over 34,000 kilometers since he first set out on his legendary treks. Fugate, a native of Florida, had never really been a fan of walking, but he found it to be a great way to spread love after he lost his children. 1999 was a particularly tough year for him. He was going through a failed marriage and his business had taken a hit. To make matters worse, his son Stevie, 26, was convicted of drunk driving. It was all getting a bit too much to handle, so Fugate decided to go trekking on the 2,167 mile Appalachian Trail, leaving his son in charge of the business. For a while, Fugate set up a non-profit organization to accept donations towards his cause. But he soon stopped. Now he refuses to accept any kind of charity. 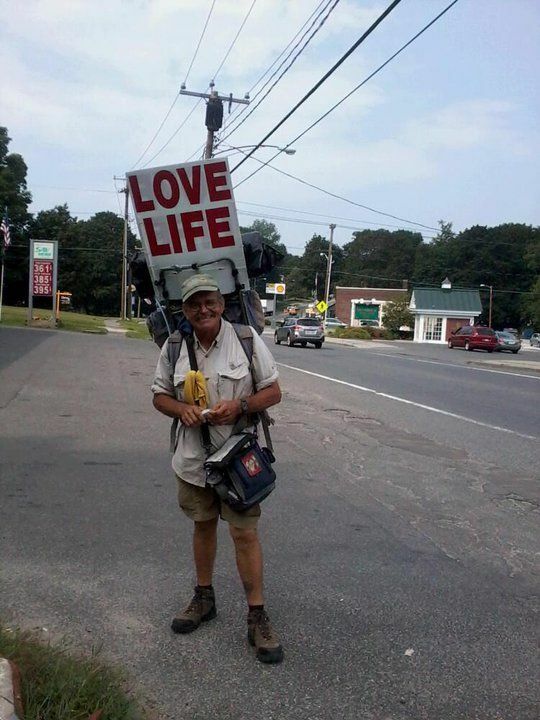 He only walks to raise awareness about depression and suicide, and to encourage people to love their lives. “I’ve lost both my babies. If I can love my life, anybody can,” he said. Fugate isn’t sure how many people he might have saved so far. “I tried to count them up before, but I can’t get past one,” he said. It turns out that one of the people Fugate helped was his own son’s friend. “A young man reached out to me and said, ‘I went to school with your son.’ He just wrote me and said he was in his 40’s now, and had gotten into drugs and a few other things. He thought that killing himself was the only way out.” But now the man is sober and free of suicidal thoughts for two years. “He didn’t do it because it would have made him feel rotten to do that to me. He didn’t even know me,” said Fugate. Next Post: Why Words Like “Hero” and “Saint” Have got to go. 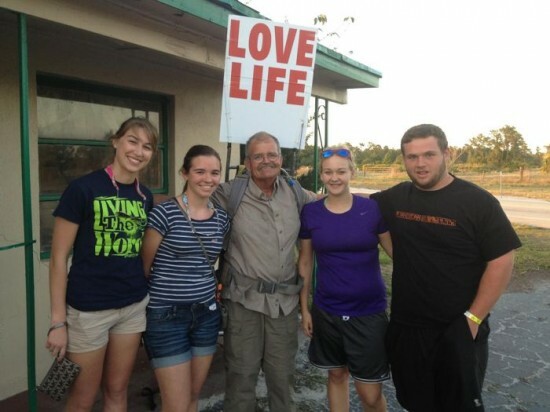 Steve Fugate, trekking for Kindness and to Love Life. A must read of an incredibly moving story. Credit to Chuck Douros who blogs at http://runwritedig.com a real humanitarian.